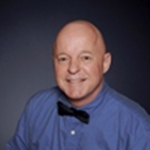 New member introduction and WELCOME! 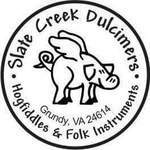 What's a Traditional Appalachian Dulcimore? Welcome to The Traditional Appalachian Dulcimore! Enjoying building this new site and can't wait to see where it goes! Between working on the Piglet for Berea and a Boss Torc I'm selling I've been trying to remodel my hillside mower I built last year. 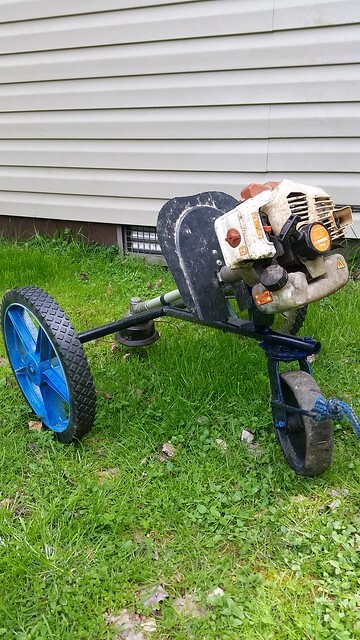 I can't stand on the steep hillsides and mow any more due to the neuropathy in my feet so last year I came up with this thing. It's been a big help. 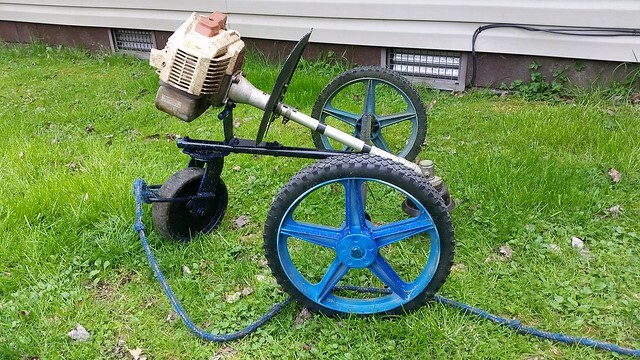 I bought a cheap chinese made weedeater off ebay last year. I have around $250 in it. Last year I mowed my hills, my son's and my dad's. I would have spent at least $500 on mine alone if I had to hire someone. When I remodeled it I addressed a few issues. I had the rope tied to the "T" frame last year and the higher pull point would make it turn over if it got stuck on a rock or something. So I made a new rope mounting point on the swivel wheel. 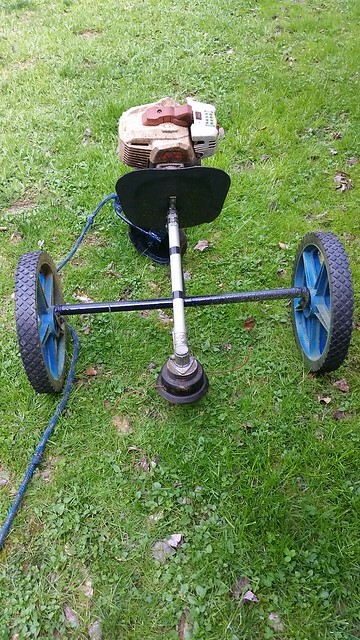 I had wire spoke cart wheels on it last year and they were really heavy so I replaced them with plastic. I also shortened the shaft even more and I cut a little over 10 pounds of weight off it which makes it much easier to tug up and down the hillside. I also added a grass guard to keep from throwing so much grass all over the engine. And last but not least, I made a hinged motor mount so the head will better float over obstacles instead of causing one wheel to lift off the ground when it went over a hump or rock. That seems to work really great now. I tried it out on the most difficult section where I usually have the most trouble with it and it worked excellent. This motor is only a 27cc so I have to take my time with it and cut at least every 4 weeks. 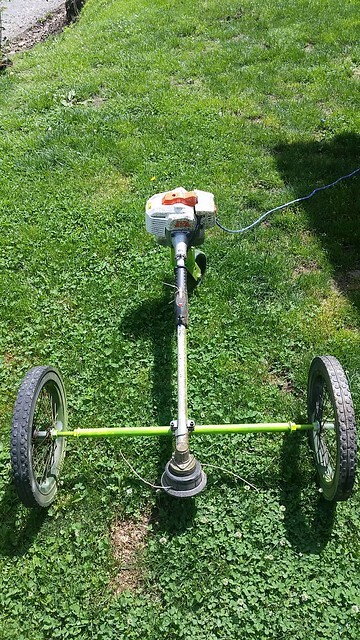 this winter I'm going to have an aluminum frame built and go to a 44cc weedeater and I should end up with the same weight and extend my cutting to around 5 weeks apart. “It is far. But there is no journey upon this earth that a man may not make if he sets his heart to it." 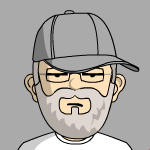 Quite ingenious, Bobby! 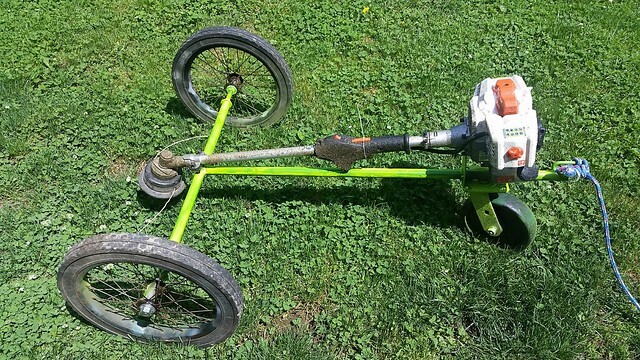 Looks like something on YouTube: Like "10 Best Homemade Mowers". I got a fire barrel chop full of great ideas! Quite ingenious. Looks great. Dad always said "Need is the mother of invention." You have come up quite a useful tool. Congrats.